Shot from the same spot with the same exposure and framing 1m18s apart and aligned by the street signs below, an overlay size comparison of the 737-700 and the A380-800. The 737 landed first. Note the identical altitude of both airplanes. Wow, what a perfect timing! "This is a photoshopped image, the photographer was careless enough to put the original image on this site and blow his own story out of the water. 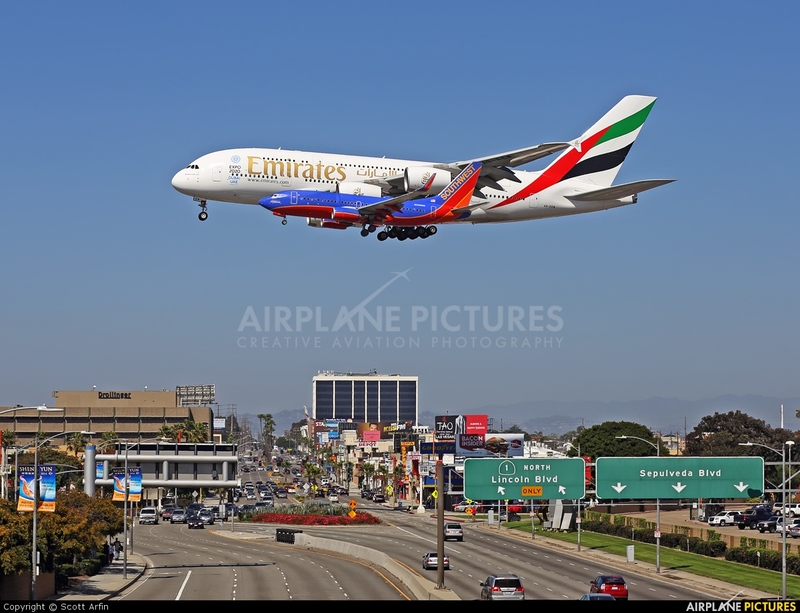 Search Airbus, A380, Emirates Airline, USA - California, LAX and the original will be observed. This is dish"
EDITORS NOTE This is in the Composite section, it is not supposed to be a real picture. The author uses the words "overlay comparison."